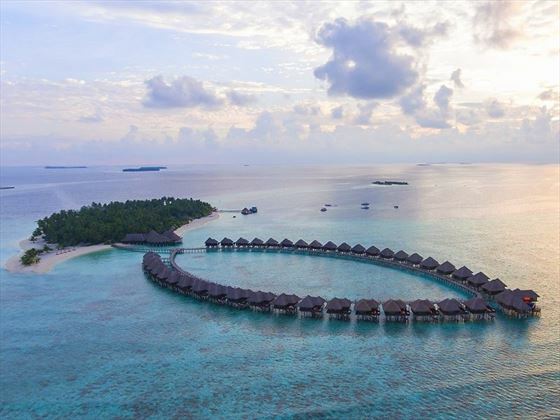 Accessible by a charming seaplane flight over the stunning beauty of the Maldives, Sun Aqua Vilu Reef provides a wonderful first impression before you’ve even set foot on the island. There’s a secluded feel to this property that creates the ideal ambience for relaxed and peaceful holidays – the efficient staff are attentive to everyone’s needs to ensure that you feel at home throughout your entire stay. 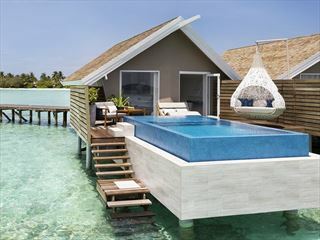 Honeymooners will love the intimate nature of this resort, where the stylish villas blend seamlessly with the unspoiled nature of the region. 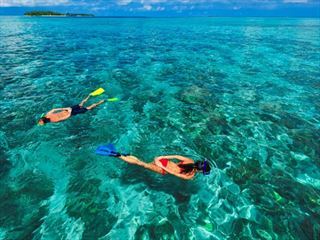 The activities here make the most of the environment, with watersports, sailing and excursions all available to enjoy. There’s also regular evening entertainment such as live music and cultural shows. Families will love the spacious accommodation and kids playground that younger guests will love, while couples will enjoy the scenic vistas and romantic nature of this amazing destination. 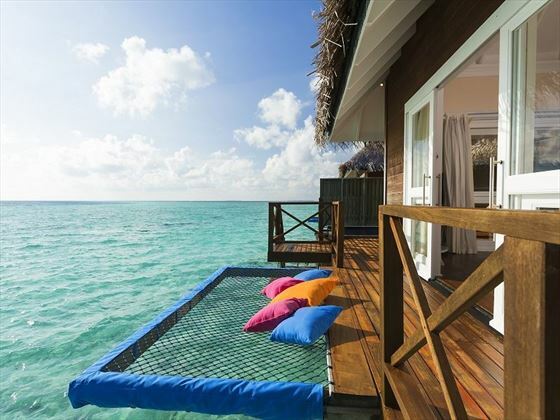 Sun Aqua Vilu Reef is located on Meedhuffushi Island in South Nilandhe Atoll, surrounded by the exotic scenery of the Maldives. The resort captures the essence of this region’s natural beauty with tropical foliage, pristine beaches and cobalt waters. Sun Aqua Vilu Reef operates +1 hour ahead of Male for daylight saving time, your onwards seaplane to Male Airport will reflect Male time. 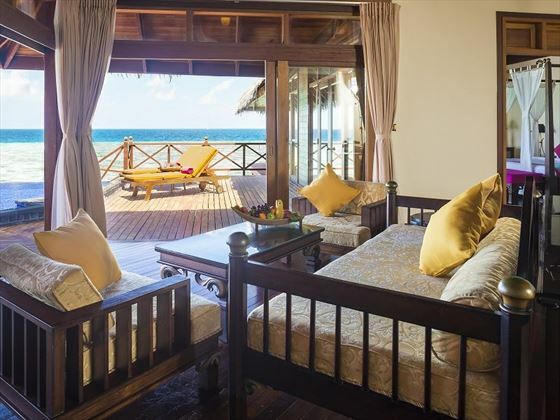 Beach Villa - Surrounded by tropical foliage with views of the beach or gardens. 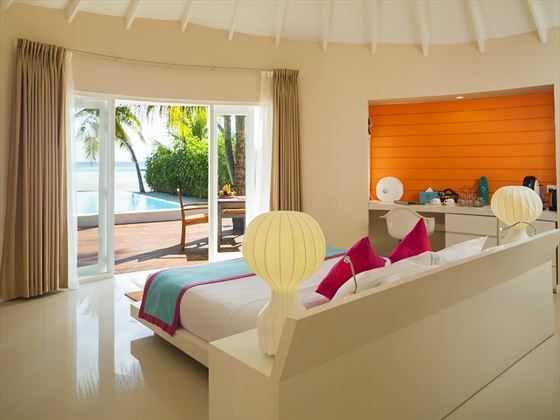 Featuring a bright tropical theme, private sundeck and an outdoor shower. 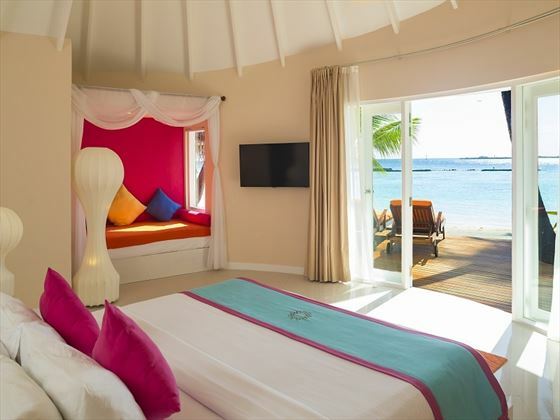 Deluxe Beach Villa – Features the same facilities as the Beach Villa with the addition of bath and Maldivian style swing. 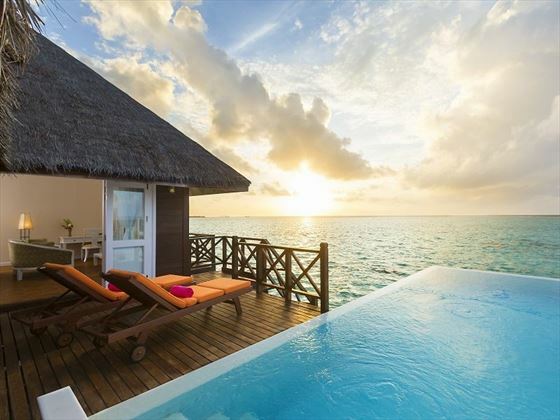 Sun Aqua Pool Villa - A luxury villa with sunset views, private cabana on the beach with Maldian swing and a large private pool. 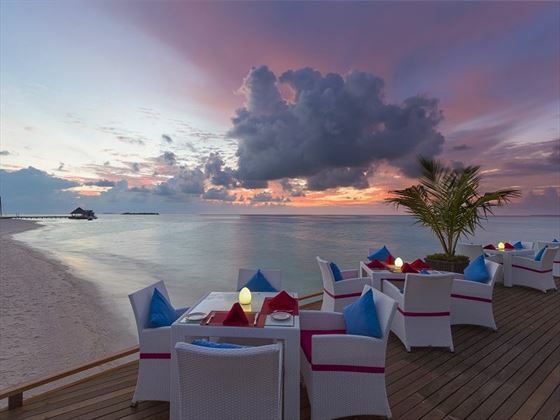 The Well Done - Grill restaurant, fresh fish & seafood right on the beach. 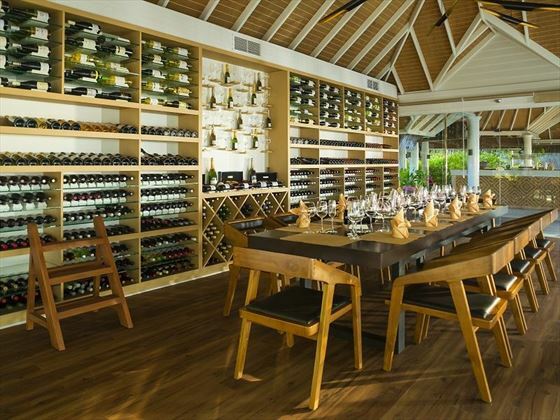 The resort also offers destination dining and private dining experiences upon request. The resort features an outdoor playground and also offers a babysitting service to children over the age of two years. One complimentary neck and shoulder massage at Sun Aqua Spa, per person per stay. Use of fitness centre, volleyball, table tennis, darts and tennis. 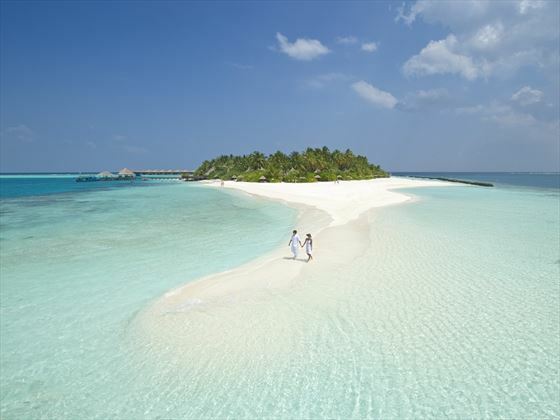 Honeymoons must take place within 12 months of wedding date. Copy of marraiage certificate required. 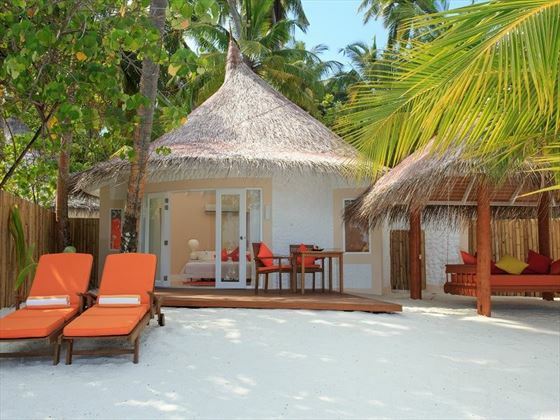 Kurumba was the original resort in the Maldives and has been welcoming guests for many years. 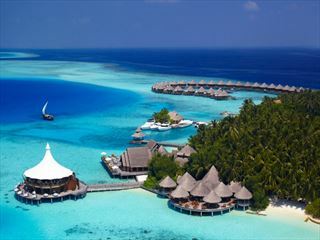 The resort offers an excellent choice of accommodation and dining options to cater for many tastes and budget. 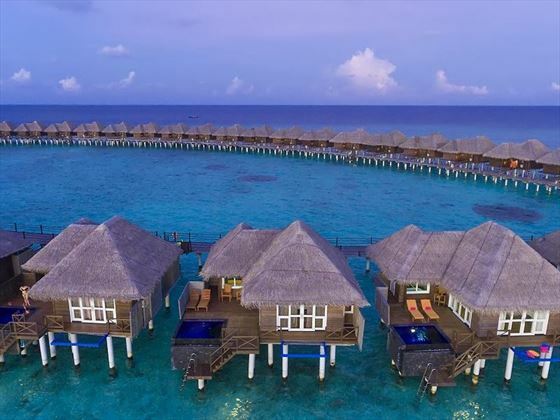 In South Ari Atoll, the LUX* South Ari Atoll is everything you would wish for from an idyllic Maldivian resort with a fantastic range of villas and dining options to suit all tastes. Plus it has the best whale-watching opportunities!